In the article “What Great Managers Do” (Harvard Business Review, March 2005) Marcus Buckingham presents some of his findings from in-depth research conducted with top performing managers. In short he finds one characteristic that really distinguishes top performing managers from the pack of average managers: Great managers identify what is unique about each employee and capitalize on it. This seems to be a rather obvious trait of a great manager, what is less obvious is how you identify the uniqueness of each of your closest employees and how you capitalize on these strengths. To get the most out of your individual employee through good management requires insight into three parameters: the strengths of the person; the motivation that activates those strengths; and how the employee integrates new knowledge. Gaining full insight into an employee’s strengths and weaknesses can be a time-consuming and challenging task. The greatest managers spend time on observing and listening to how employees react to different situations and make personal notes on what the individual employee is attracted to in terms of working tasks. Simple and open questions such as: “Can you describe the best day you’ve had at work in the last few months?” can support the personal observations. And you need to dig deeper and find out why this day was such a great day at work. To understand a person’s weaknesses you just turn the question upside down and ask for a description of the worst working day. These kinds of open-ended questions will make your employee think of what interests them and what abilities they posses – or vice versa. Motivation can be a difficult double-edged sword to manage. Saying or doing the right thing at the time can really ignite a spark in an individual making him or her push harder and stay focused to reach a specific goal. On the other hand, saying or doing the wrong (or even the right) thing at the wrong time can have the exact opposite effect. However, one of the most motivational factors people react positive to is acknowledgement. The great manager finds out when their employees react best to acknowledgement. Some people get a kick when being publicly appraised in front of peers and colleagues; others find an appraisal most powerful when it’s given under four eyes with you – the manager. Yet other people are best motivated by prizes giving recognition their professional expertise, and some people by competitions. The great manager identifies what motivates the individual and finds a path to combine the different ways of motivating people. As management consultants we always encourage a hiring manager to conduct a behavioural analysis of the final field of potential employees. A behavioural analysis can at an early phase help reveal a person’s strengths, weaknesses and motivational factors. Understanding how people integrate new knowledge is crucial for both the individual’s motivation and for capitalizing on particular strengths. If a manager tries to learn an employee how to do a particular task in a way that do not conform to the employee’s way of learning it can cause failure, lack of confidence, and the manager might miss out on an employee’s strength by interpreting the failures as a sign of a weakness. In general three ways of integrating knowledge exist: analysing; learning by doing; and learning by observation. Most people will possess elements from all learning styles, but one will be more dominant than the two others. It can be discussed to what extent learning by analysing and learning by observing are the same or at least overlaps. But learning by analysing is expressed through questions such as why, what and how. The employee will try to decipher a task by dissecting it into smaller elements, analyse these before trying to reconstruct the task by him/herself. The employee will hate to make mistakes, which is why the manager must be patient, provide plenty of time for the person to analyse the task. A tool the manager can use is role-playing with the employee, furthermore the manager could benefit from thinking of what components the task is composed of and how these interact. Learning by observation differs from learning by analysing in that the employee will not learn from role-playing. The observer will ask fewer questions, be more quite, and try to cognitively comprehend the task. As a manager you could benefit from being aware of how the task can be de-composed into small sub-tasks and show these to the employee. Learning by doing is more or less self-explaining – the learning process is mainly characterized by trial and error. This individual will be more autonomous, need less teaching, and less preparation. Especially preparation will drain this person’s energy and motivation. As a manager the best thing you can do is to explain the task shortly specify the required outcome and then set the employee free to solve the task. This person will come to you in case of any questions. 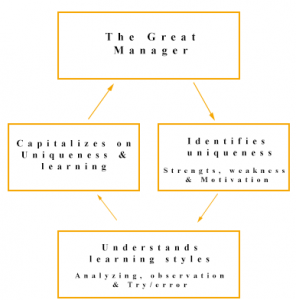 After having identified the uniqueness of the employees the great manager puts it into play by providing the employee with a high degree of confidence in the possessed strengths, which is a powerful way to increase the employee’s ability to set and reach ambitious goals. The great manager will appraise how good the employee is to capitalize on his or hers strengths in the right forum where the employee will be further motivated. Finally the great manager capitalizes on uniqueness by combining it with the uniqueness of other employees. As Marcus Buckingham puts it: “Average managers play checkers, while great managers play chess”. In chess you must think two steps ahead and combine the strengths and characteristics of each chess piece. The great managers do the same by adapting roles and tasks to their employees. Make people who possess different strengths interdependent in order to get them support each other. It’s very difficult to change a person’s style – it’s easier to capitalize on the uniqueness be adapting the role to the person. In terms of chess – the great manager wouldn’t try to move a rook as a bishop. Rasmus is our youngest management consultant. He is heading our Business Development, including social media and marketing. Currently he is finishing a master degree in management of innovation processes. He is a promising talent showing a profound understanding of how to cope with strategic challenges and organizational development.